The cultural medium of art is no longer reserved for exclusive galleries, or hidden away inside collectors’ homes. Instead, the accessibility of art has grown exponentially in the modern world – both in the sense of who is making the art, and who is seeing it. As a result, art is everywhere, from the walls of a gallery to the tube stops of London. 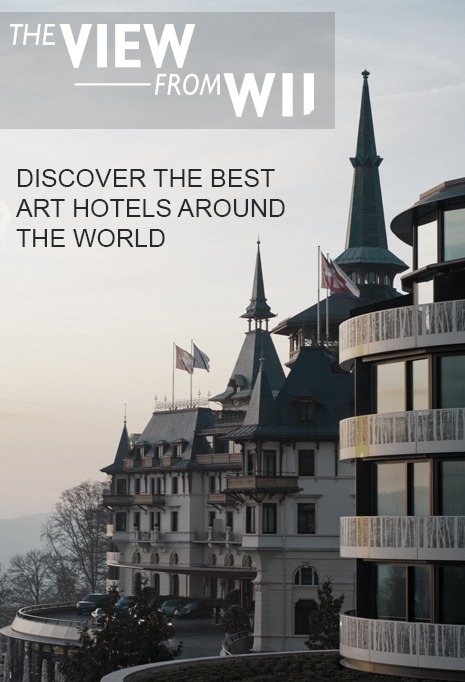 Art hotels combine this global appreciation of art with luxurious places to stay, making them coveted destinations in both the art and travel scenes. We list our top five art hotels in the world, taking you from Alpine retreats to Italian masterpieces. 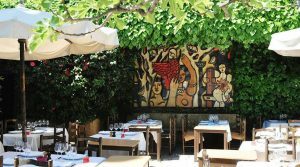 Located atop the hilltop road leading to Saint-Paul-de-Vence and in between the hubs of Nice and Cannes, this hotel perfectly balances the rustic charm of a French family-run hotel with one of the most extraordinary art collections. The story behind the hotel is equally fascinating; during World War II, painters and liberals seeking refuge on the coast often found lodgings at La Colombe D’Or, and then paid for their board with paintings. Today, the hotel houses a compendium of works ranging from Matisse to Chagall – a collection to rival the most prestigious galleries in the world. 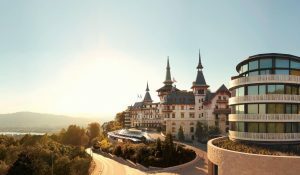 When the hotel wouldn’t be out of place in a fairytale, you know you’re on to something special. The Dolder Hotel in Zurich nestles itself between Lake Zurich and the Alps, with the city only an hour away – an idyllic position. The architecture of the hotel is similarly impressive, with two wings designed by Norman Foster boasting steel, stone and tinted glass that juxtapose the turreted rest of the building. 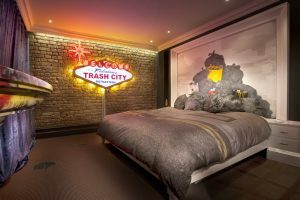 Inside, you are greeted with an 11-metre Andy Warhol piece, whilst works by artists such as Dali and Henry Moore litter the walls of the remainder of the hotel. For a getaway that is as steeped in relaxation as it is art, look no further. With the Natural History Museum as its neighbour, the Exhibitionist Hotel certainly lives up to its name. The open plan ground floor is filled with statement sculptures and set pieces, including a life-sized bull, a Jimmie Martin mannequin lamp and bark-crafted ballerina legs. Yet the striking entrance and its décor are not the most remarkable aspects of this hotel; instead, look for the rotating artist spaces within the rest of this South Kensington Hotel. Eight spaces have been handed over to contemporary artists for decoration on a bi-annual basis. This ever-changing boutique hotel is one to visit again and again, if just to see the latest installation. On the periphery of the city centre, the Rome Cavalieri holds 15 acres of grounds, overlooking the city of Rome and including three pools, tennis courts and a full wooded parkland. The stark, rather brutalist architecture of the hotel is tempered by its lavish interior, which is where the Rome Cavalieri gets its luxurious reputation, gathering high society members since it opened its doors. The property is covered in a collection of over 1,000 paintings, sculptures, furnishings and antique tapestries, as well as works by Robert Indiana, Warhol and Nureyev’s ballet costumes. 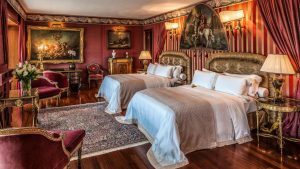 Overall, the claim that this hotel is one of the best art hotels in the world holds considerable worth, and is perfect for those with an appreciation of both history and fine art. One of Barcelona’s original luxury hotels, Hotel Arts is located right on the seafront in the Catalan Olympic Village, with coastal views and surrounded by beach-style restaurants and bars. With a minimalist modern aesthetic and exposed glass and steel architecture, the Hotel Arts blends old-school service with sleek décor. 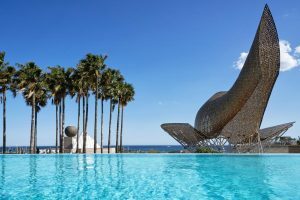 The enormous fish-like sculpture of the Frank Gehry-designed Peix is one of the key landmarks for this hotel, but it also puts on major exhibitions throughout the year, including Picasso and Dalí, as well as more contemporary names such as Xavier Corberó. For those looking for the rare combination of art escape and beach break, Barcelona’s Hotel Arts is the answer. London W11. All Rights Reserved. Website designed by Akira Studio.